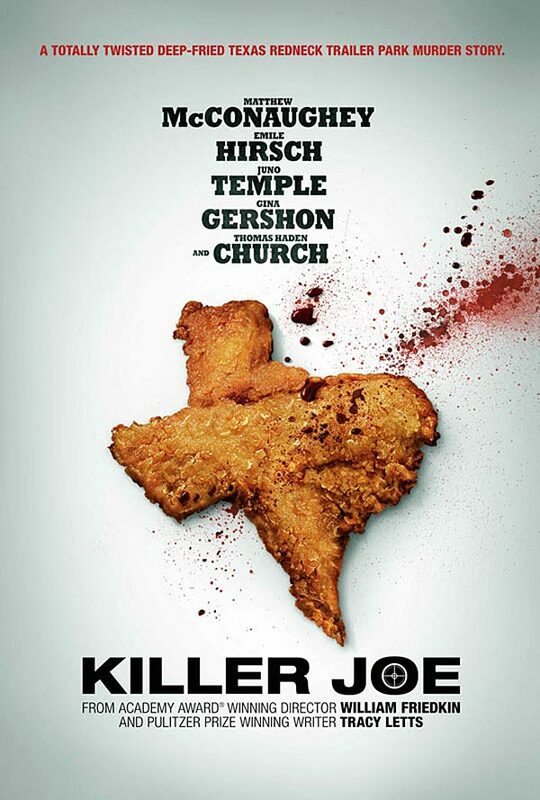 Cinedelphia has a whole mess of pairs of tickets to attend an advance screening of Killer Joe that will be held on Tuesday, August 7 at 7:30pm at the Ritz Five. E-mail us to enter, only one entry per household, winners will be e-mailed a download code on Monday. Finding himself in considerable debt, Chris (Emile Hirsch), a Texan drug dealer, decides the only solution is to murder his mother (Gina Gershon) to collect the insurance money. Getting together with his father (Thomas Haden Church), the ex-husband of Chris’ mother, they decide to hire Joe Cooper (Matthew McConaughey) a contract killer, who also happens to be a police detective. The plan is that the money will go to Chris’ sister Dottie (Juno Temple). However due to the size of the contract fee, Chris agrees that Joe can take Dottie as a retainer until the insurance comes through. Directed by William Friedkin (The Exorcist).